When accuracy is important, you need an NRC certified Geiger counter. An NRC certification certifies your Geiger counter has passed 10-CFR-34 and 10-CFR-35 United States Nuclear Regulatory Commission (NRC) accuracy standards. Manufacturers want to compete on price, not on our U.S. Government's NRC certified accuracy. Don't believe a manufacturer's unproven claim of accuracy. NRC Geiger counter accuracy for certification can only be tested by a laboratory licensed by the United States Government. Without an NRC certification, you can not be sure if any claim that a Geiger Counter accuracy is valid. 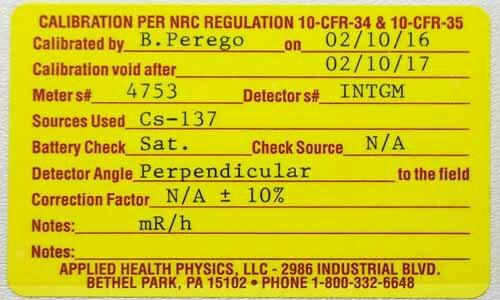 Below is a picture of an NRC certification label attached to the back of our Digital Geiger Counter. This certification is valid for one full year. Before you buy, ask if their Geiger Counter is NRC certified? If not, their Geiger counter probably can not pass NRC certification. But is a seller claims the NRC certification is expensive and is not necessary. Ask, "If I send your Geiger counter for NRC certification will it pass? And more importantly, if it fails NRC certification, can I return the Geiger Counter for a full refund?" The seller's answer will tell you what you need to know to make a sound purchasing decision. * All digital Geiger counters sold by Images SI Inc. can be NRC certified to their accuracy. The new standard in radiation measurement. 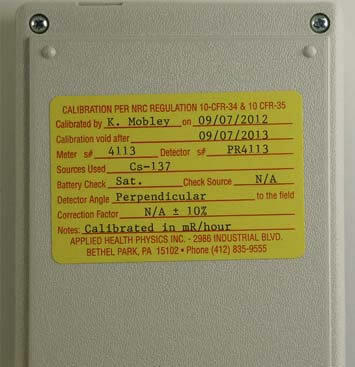 We sell the only digital Geiger counters in our price range accurate enough for NRC certification. We don't just say our Geiger counters are accurate, we can certify it! Photo of the NRC certification label. Calibration is per NRC Regulations 10-CFR-34 and 10-CFR-35. Certifications are good for one year. NRC Certifications are an additional $125.00. Certification adds 2-3 weeks to the delivery of your order. This is the time necessary to send and receive your Digital Geiger counter to our laboratory for certification. Once your certification order is in process to our lab, cancellations have a 50% restocking fee, on the both the Geiger Counter and certification fee. See a sample certification sheet here.